They say there are always three sides to every story, and this one is no exception. The first one is personal. If you ever worked for a software company, you know there is no better reward than seeing a new solution going into the market, after you were involved in its creation, at any level. Even if you are not a programmer, like I am not, there are many ways you can contribute to the creation process. One year ago I was still working for a Veeam partner and customer, and I suggested on the Veeam forums a new idea. It was August 2013, so I was invited by Veeam to meet and talk about it during the upcoming VMworld. Fast forward some months, I’m now working at Veeam, but most of all some of the concepts behind that idea are now part of a solution that will be available in the new Veeam Availability Suite v8 (which includes Veeam Backup & Replication v8 and Veeam ONE v8). Its name is Veeam Cloud Connect, and I can’t be more happy about it! The two other sides are about Veeam Cloud Connect itself, and are deeply interconnected: it’s the story of customers looking to extend their data protection outside of their data center, and the story of service providers offering Veeam-powered services to their customers. When we at Veeam talk about data protection best practices, we recommend that customers follow the "3-2-1 rule": 3 copies of any data, on 2 different media, with at least 1 copy in a remote location. This is an effective strategy to greatly enhance the availability of their precious data, but requires at least two sites. With Veeam Cloud Connect, there is no need to own the second site; the same solution can be offered by a service provider, so a customer does not incur capital expenses to build and maintain an additional infrastructure, but instead can quickly and easily consume a service with a “pay as you go” model. This is what Veeam Cloud Connect makes possible, and it’s the meaning of its name: a connection between Veeam customers and service providers to send data offsite easily and in a secure way. As a 100% channel-focused company, Veeam will be the enabler of this connection: service providers will be able to license the technology for their side of the Veeam Cloud Connect connection through the Veeam Cloud Provider (VCP) program. With it, they will be able to build their own remote repositories with an architecture that was built from the ground up to be multi-tenant and scalable. Veeam Cloud Connect removes the two main hurdles that such a service required in the past: VPN tunnels and dedicated repositories. 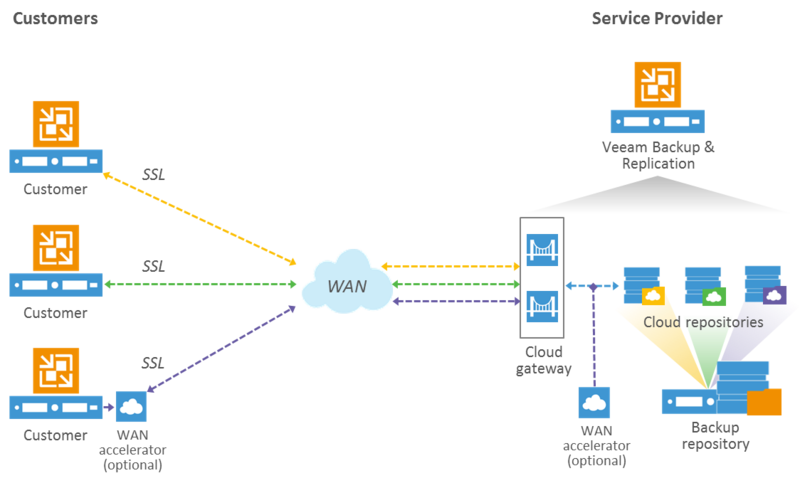 VPN is not easy to be automatically configured, and usually requires an interaction between the service provider and the customer. With Veeam Cloud Connect, the connection will happen directly over the Internet, using a single TCP port protected by SSL encryption. This will be possible thanks to a new Veeam component, called the Cloud Gateway, responsible for the encapsulation of all the backup traffic inside the SSL tunnel. The second new component is called the Cloud Repository. Its role is simple and powerful at the same time: it creates an abstraction layer over an existing backup repository, so that multiple customers can store their backups inside the same shared repository, with the same level of confidentiality they have with a dedicated repository. The final component is the existing WAN Accelerator: any customer with Veeam Backup & Replication Enterprise Plus Edition will be able to use the acceleration and speed up their backup copy operations. All this is managed by the service provider via the Veeam backup console, automated with PowerShell, or integrated in an existing customer portal thanks to a RESTful API. What changes at the customer site? Absolutely nothing, and this is the beauty of the solution. Any customer with a paid license of Veeam Backup & Replication v8 will have the client component of Veeam Cloud Connect available in the usual user interface. Directly inside the Veeam backup console, it will be possible to find a service provider offering Veeam Cloud Connect , selecting the desired one by country and/or other parameters; once the service has been subscribed between the service provider and the customer, the latter will receive the needed parameters to activate the Veeam Cloud Connect service. Once the new repository is added to the console, you can start using it just like a regular backup repository: make it a target for any backup or backup copy job, and perform restore operations! And for complete security, the recently announced encryption capability in Veeam Availability Suite v8 will be available for any job pointed at Veeam Cloud Connect. The final result will be an end-to-end encryption solution, from the customer site, through the Internet, up to the final Cloud Repository. But the best thing is that the data reduction ratios of our Built-in WAN Accelerators will not be impacted by the fact that the data is encrypted, as is the case with general-purpose WAN acceleration. After all this exciting news, probably the next question is: when will it be available? Veeam Cloud Connect will be available to customers inside any paid version of Veeam Backup & Replication v8. Meanwhile, Veeam is actively working with several leading service providers around the world so they will be ready to offer targets for Veeam Cloud Connect on the first day v8 is generally available (GA); after GA, any existing or new Veeam Cloud Provider will be able to license the service provider piece of Cloud Connect and offer hosted backup repositories to its customers. This is my special 3-2-1 rule: 3 sides of the same story, 2 entities who will be able to connect and offer or consume a powerful service, all thanks to 1 powerful solution: welcome Veeam Cloud Connect!